The world of fitness has added a new method for people to get into shape. It is called pickleball fitness and it’s sweeping the nation. Basically, it is a cross between tennis and badminton. A badminton court is used, although a tennis court can be converted to play, and a lowered net with players wielding paddles that are larger than standard table tennis versions. Add in a Whiffle ball and a set of simple rules and you are ready to play pickleball. You can use the rules from the International Federation of Pickleball as the basis for your tournaments. Plus, you can make modifications if you want for friendly matches. This is a sport that has managed to cross over from sports enthusiasts to fitness enthusiasts thanks to the simple, unique nature of the game itself. 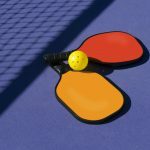 Pickleball started in the US, but has quickly spread to Canada, Europe, and India to become quite popular for those who want to have a great time getting into shape. Because pickleball fitness is fun for all ages, it’s easy to get your family involved in this marvelous game. 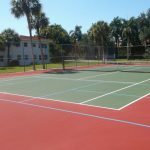 Plus, it’s quite inexpensive as all you need is the available court and equipment to play. You can hold small tournaments among family and friends or create larger leagues that can meet regularly to play. The friendly competition it provides makes a great way to stay in shape because you are focused on doing your best. Because of the simplicity of the game, it is currently being taught in gym classes and fitness centers across the nation. The aerobic activity helps to burn calories by working all the muscle groups. However, the concentration that the game requires also adds to burning the excess fat because you are focused on reacting to the opponent which requires even more energy compared to traditional exercise programs where you know what happens next. Traditional exercises can be boring which is one reason why pickleball has become more popular. It combines sports with fitness by allowing the player to be in motion, moving their arms and legs in reaction to the ball. It’s also easy to learn, fun to play, and provides endless hours of entertainment as you play with your family and friends. If you are looking for a great way to get into shape and have fun while doing it, pickleball is the answer.